Article 2 of the Constitution recognizes indigenous peoples and their territories. The Constitution, approved in 2009, declares Bolivia a “plurinational State” and recognizes the country’s indigenous peoples as nations—one of the promises made by President Evo Morales, who belongs to the Aymara indigenous community and has been in power since 2006. To illustrate, Ms. Cabrera cited a recent land conflict which she said exemplifies the situations experienced by her people. Staff from the state-run National Institute of Agrarian Reform (INRA), responsible for legalizing land titles to rural properties, made an unwelcome visit to the town of Quila Quila on Feb. 27, with police backup. “Forty police officers and 150 other people ambushed the local inhabitants” to facilitate land measurements requested by ‘third parties’ [people outside the community],” Ms. Cabrera complained, referring to an incident that occurred while the march reached the city of Oruro, historically a hub of Bolivia’s social struggles. 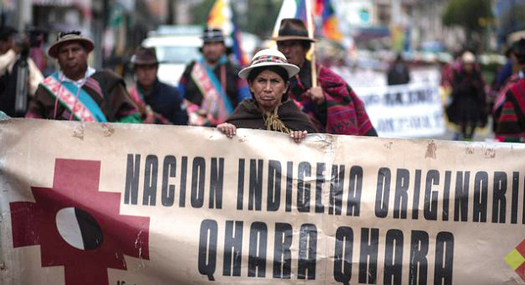 Located between the departments of Potosí and Chuquisaca, the Qhara Qhara— which in the ancient Qaqina language means two hills—people have been fighting for recognition of their culture since 2002, together with the Pikachuri and Qaqina peoples, former “kuraca” Samuel Flores told IPS. Mr. Flores, who like Ms. Cabrera is a spokesperson for his nation and an organizer of collective initiatives, explained that the Qhara Qhara people currently number 48,000, distributed in eight “markas” (indigenous territorial units). Morales capitalized on those demands to become the country’s first indigenous president. He then channeled them to a Constituent Assembly that in 2008 completed the drafting of the new Constitution, which since 2009 has been the framework for the promised restitution of indigenous rights. This ethnically diverse landlocked South American country is home to 36 recognized native peoples, the largest of which are the Quechua, Aymara and Guaraní. The aim, she said, is to obtain rural property with individual titles in order to commercialize the land and not use it for crops. The indigenous leader said their struggle for legislative changes will favor other native groups who are demanding the restitution of their lands and the recognition of indigenous judicial authorities. If the results are not satisfactory, she explained, a national mobilization “of all indigenous peoples and nations” will be called, to mount pressure until their demands are met.